The WT-100 Forced Convection (Moving Air) Wind Tunnel is designed in accordance with the EIA/JEDEC JESD51-6 standard for thermal characterization of semiconductor packages and devices. 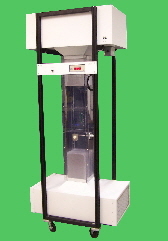 The vertical design minimizes laboratory floor space requiements. Air is drawn in at the bottom and exhausts at the top. The test section is large enough (8” x 8”) to accommodate the largest JEDEC and SEMI thermal test boards. Air velocity can be adjusted over the range of 0.5 to 5 m/s; air velocity is monitored with an included hot-wire anemometer connected to a digital display. A Type-T thermocouple is mounted in the test section for monitoring the moving air temperature. The NC-100 Natural Convection (Still Air) Environment is designed in accordance with the EIA/JEDEC JESD51-2 standard for thermal characterization of semiconductor packages and devices. 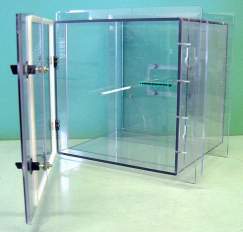 The one cubic foot enclosure has an internally mounted Type-T thermocouple for monitoring enclosure temperature. Also included is a dual 18-contact edge-card connector for accepting both JEDEC and SEMI standard thermal test boards. If you would like more information on any of these Test Environment Products or have suggestions for other products that TEA should consider, please contact us by e-mail using the address shown above. You can also use the TEA message response form.